What Candies Would You Buy With $3,440? Earlier today we came across an article that most certainly caught our attention – “12-Year-Old French Girl Writes Bad Checks For Candy and Pastries.” At first we thought it was going to be one of those stories where the child is both cute and naughty. You know, like perhaps she stole a check and bought a pack of gum and a lollipop? But this girl’s sweet tooth required much more than a pocket full of change’s worth of treats. Once her gig was officially up, she had dropped approximately $3,440 of someone else’s money on candy and pastries! This dollar amount got us thinking about how far $3,440 would go at Blair Candy. And just for fun we decided to create a shopping list equaling roughly that amount! Below is a list made up of the Blair Candy team’s top picks. What candies would your $3,440 list contain? The One… The Only… The Rainbow Swirly Lollipop! How excited do I get when I see free Dum Dums on the counter at the bank or a restaurant? Probably more excited than most. How high do my eyebrows raise when I spy seasonal Tootsie Pops? Pretty high! How much do my eyes light up when someone offers me a Ring Pop, or I remember I have a bag that I’d forgotten about? Let’s just say they get pretty sparkly! I’m a lollipop kinda lady, and it’s rare that I meet one I don’t like. 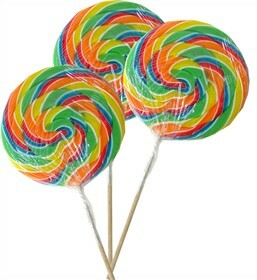 But for as fabulous as all those mentioned above, and many, many more may be, I do believe the first lollipop to ever leave me speechless was a Rainbow Swirly Pop. The Rainbow Swirly Pop is more than just a lollipop, and that means a lot coming from someone who thinks almost all lollipops are to be treasured no matter their shape, size or wrapper! It is a thing of sweet beauty – a giant wooden wand with ribbons of wrapped deliciousness on top. It is oversized without looking like a novelty. It is boldly colorful without looking like it’s only for kids. It offers a classic flavor that isn’t the least bit ‘sickeningly sweet’ like some candies can be, even when you’ve been enjoying it for an hour! It is a lollipop made for lazy summer nights, something I’ve been loving for weeks now. It also happens to make a great stocking stuffer, present topper, and impactful addition to a candy buffet. So basically, it’s lollipop perfection!